Many people who live in Spain take a lot of time when it comes to getting quotations to find cheap car insurance but very few people consider what might happen if they actually have an accident or collision with another car or other motor vehicle. 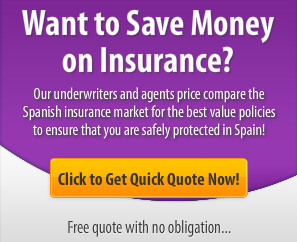 At this point your Spanish car insurance and what you are covered for becomes critical. In this article we look at the basic steps you should take with the other party should you have a car or motor accident in Spain. Most accidents in Spain probably involve fairly minor scrapes and bumps as a result of parking mishaps or minor collisions especially at places like roundabouts or when pulling out from junctions. At this point you need to consider the excess both compulsory and voluntary on your insurance policy. With average motor vehicle excesses for most cars being around €250 it is often worth settling the matter with the other driver. If both vehicles are equally damaged you may just decide to leave the matter and pay for the damage yourself presuming it is going to cost less than the excess. You Have Been Involved in an Accident – Now What? Should you be involved in a serious accident in Spain it is wise to immediately call 112 for both the police and an ambulance should it be required. Do you have private health insurance for Spain or are you covered under the Spanish National Health System? Although you may be shaken and shocked try get contact details of any witnesses to the accident which is vital when it comes to your insurance claim. Getting a police report can be a real help when there is a dispute over the cause of the accident. With your insurance documentation comes a standard form which should be filled out by you and the other driver. There is space on the form for you to draw a diagram of the position of the vehicles and an explanation of how the accident occurred. Always make sure you get their registration number from their license plate in case they provide false contact information such as false names and addresses and phone numbers. Also be sure to get the details of their insurers. Should you have fully comprehensive car insurance in Spain or fully comprehensive insurance for another type of vehicle such as a van, motorcycle or motorbike then you will have roadside assistance coverage which will help to remove your vehicle from the scene of the accident. This typically can be taken to the nearest garage. As soon as you possibly can contact your broker or company with regards to the accident. They will obviously want to take all the details including the police report in order to proceed with the claim with the other parties insurers. The potential for being involved in a car accident in Spain or accidents involving other vehicles just shows the value of going to an English-speaking insurance broker who will be able to assist you when you actually need help. Too often people looking for cheap car insurance in Spain just look at the price rather than the actual service and help given to them in the aftermath of an accident. We have actually been involved in a car accident in Spain and the Spanish insurance brokers we were with which was Knight Insurance Javea were extremely helpful in assisting us and liaising with the garage in order to have our car assessed by the insurance company and ultimately fixed for just the cost of the excess. Should you be involved in a serious accident in which one of the parties requires medical attention then you may well need the services of a lawyer in order to claim for damages or indeed to protect yourself from a counterclaim.